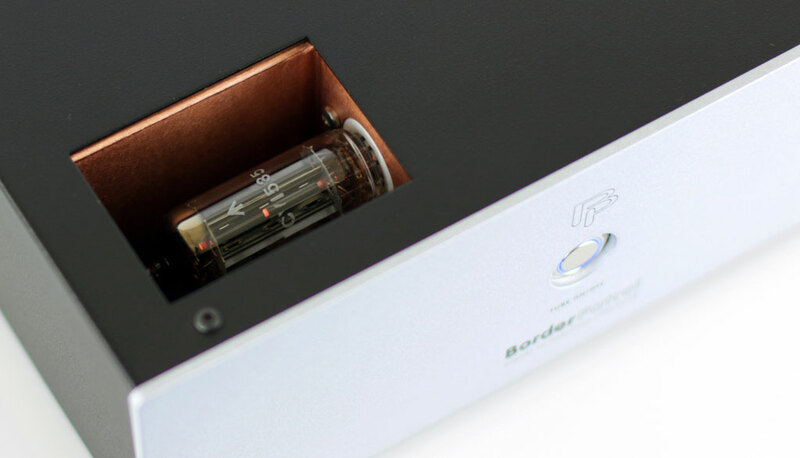 Diminutive but robust with brushed silver faceplate, the BorderPatrol DAC SE has a blue ringed pushbutton SS/Tube output selector on front, with the tube mounted horizontally in open-air niche. The unit throws off little heat. Back contains fuse protected 15A IEC socket, single switchable USB and SPDIF inputs, and 1 set of RCA outputs. No power cord. The tube type is an EZ80 that has been made by many manufacturers. BorderPatrol supplies the DAC with various NOS brands depending on availability. Pursuit of esoteric tubes is not necessary for extraordinary results. The unit sounds best when in SS mode with the tube removed, similar to the Eastern Electric Minimax Supreme Tube DAC. Tube longevity is enhanced by removal. That’s a joke. If it’s not funny, burn in this article for 24 hours and the joke will be funnier. During review, SPDIF input tested through inclusion of Musical Fidelity M1CDT Transport and TEO Audio Liquid Pre. Redbook playback performance, likely limited by entry-level quality Wireworld SPDIF cable, was characterized as simpler and less full than Tidal tracks played through Roon via USB input. CD Playback was akin to SS power operation of BP DAC, and file playback was akin to Tube rectification operation, albeit with no significant loss of resolution. Holistically, USB input was superior using 1M Clarity Cable Supernatural USB. File playback was dropout-free; Roon interface was achieved with the Benchmark DAC3 DX driver (Linux). Files above 24/96kHz were down converted by Roon, including DSD down conversion to PCM. MQA encoded tracks from Tidal’s “Masters” playlists worked (non-MQA). For superior performance, Roon’s Digital Engine was turned OFF (Potential exists for excessive sound levels and potential equipment damage if user is careless.) Preferred operation was BP DAC direct to amplifier with attenuation through Roon’s volume control, or alternatively BP DAC direct to integrated amp and Roon’s volume output fixed. SAFETY NOTE REGARDING DAC DIRECT TO AMP OPERATION: The BP DAC output is directly from the DAC chip, with no output opamp buffer. The output impedance is relatively high, similar to a Canary Audio or Audio Note DACs. The BP DAC will drive cables of typical capacitance of less than 6’ (2M). Gary confirms comment at Part Time Audiophile recommending caution with devices having less than 20kOhm input impedance. System configuration with Tidal and Roon on Salk StreamPlayer III, Clarity Cable Supernatural USB and Natural Speaker Cables, and TEO Audio KRONON Liquid Cable Interconnect with Redgum Audio Articulata Integrated Amp pushed the Legacy Whisper DSW Clarity Edition Speakers to exemplary performance. Shockingly profound dynamic output from this more reserved full frequency floor stander, though the Belles ARIA Monoblock Amplifiers powering are only 112 Wpc. Exquisite panel speaker performance achieved with Salk Audio StreamPlayer III, BP DAC SE, and Belles ARIA Mono Block Amplifiers with Kingsound King III electrostatic speakers powered by VAC Royal Power Supplies. Component combination strongly recommended for digital sourced system with speakers $25-50K. Upgrading of the fuse in BP DAC SE with HiFi Tuning Supreme (silver or gold) was profoundly efficacious. Judicious use of aftermarket power cords was efficacious. BP DAC SE readily receives power and signal related tuning and reveals changes transparently. Manufacturer’s general description of NOS (Non Over-Sampling) DACs having cleaner, sweeter treble than DACs with over-sampling and sounding refreshingly open and natural rather than processed and synthetic is something with which I concur. BP DAC SE features a sinewy, taut sound with floral tonality. Selectable tube rectification infuses warmth, but also a degree of euphonic distortion. BP DAC SE performance holistically matched or exceeded previously reviewed up converting DACs, however dependent upon system build. Cecile McLorin Salvant’s “John Henry” was brisk and illuminated with sinewy upright bass, snapping snare drum and effervescent vocals. “Clean, yet warm,” captures the DAC’s flavor. The Urban Knights’ “Sweet Home Chicago” was reproduced with big body on piano, vast depth to soundstage and no sense of digital stiffness. The listener is brought into midst of performance on Snarky Puppy’s “Shofukan”. This Jazz Fusion band’s multiplicity of instruments rendered in space like random fireworks, localized precisely and with full resolution. Orchestration was panoramic with acuity in differentiation of instruments. Macrodynamic impact acceptable with Belles ARIA 175wpc (4 Ohm) Monoblock Amps with Kingsound King III electrostatic speakers (Sensitivity 83 dB, Nominal Impedance 6 Ohms). Chip output from DAC limited listening levels by approx. 4-5dB. Superb delineation of finger contact with Bass strings or mallet and drumstick contact with drum skins. Benchmark DAC3 DX held more gain and unlimited listening level, however did not render upright bass and drums as cleanly with same amps and cables. Vocals with BP DAC SE are exemplary. Ray LaMontagne breathlessly dies in front of my eyes as he sings, “This Love Is Over.” The pipsqueak voice of John Gourley, lead singer of Portugal. The Man, is evidently trapped in high school, earnestly echoing its LF reinforced sentiment in “Feel It Still [“Weird Al” Yankovic Remix]. Victory’s “Overjoyed” remake of Stevie Wonder’s hit showcases her vocal dexterity as taut as the acoustic guitar accompaniment, with as mesmerizing a voice as Stevie’s. Bill Withers is so smooth he can’t convincingly sound angry on “Who Is He? (And What Is He To You?). The BP DAC SE beyond the digits retrieves the unadulterated emotion of the musical event. Four other reviewers have bought. BP DAC SE’s NOS performance sans tube, with HiFi Tuning Supreme gold fuse, Clarity Cable Vortex Power Cord, and conjoined/doubled interconnects (TEO KRONON or Clarity Organic, dependent upon speakers) direct to Belles ARIA Mono Block Amplifiers established the finest reference system with electrostatic and dynamic speakers to date. Anticipation of similarly positive results with other passive speakers. Inclusion of active subwoofers with speaker level inputs from amps also proved highly efficacious, resulting in cleanest subwoofer performance to date. What an excellent and thoughtful discussion with GD and then review/assessment. I appreciate your insights and can’t wait to get mine from Gary in the next week! Great review. I purchased this DAC after listening to a number of other hi-rez DACS and have never looked back. Total musical satisfaction every time I play a cd or a download. I upgraded mine with a Triode Wire Labs digital power cord. Made the BP DAC shine even more. One of the best equipment purchases in my 60+ years of listening to music.